Microsoft has posted earnings for the third quarter of its 2017 fiscal year. And while its non-GAAP revenue of $23.6 billion and non-GAAP earnings per share of $0.73 was in line with Wall Street’s expectations ($23.6 billion revenue, $0.70 earnings per share) shares fell by 1 – 3 percent in after-hours trading, though they've since jumped back up. As usual, the Intelligent Cloud Unit, which is made up of the Microsoft Azure cloud and Windows Server businesses, had a successful quarter. It hit $6.8 billion in revenue during 3Q2017, up 11 percent compared to the same period a year earlier. The company expects its cloud business to reach a $20 billion run rate - calculated by multiplying revenue from the last month of the quarter by 12 - by next year. 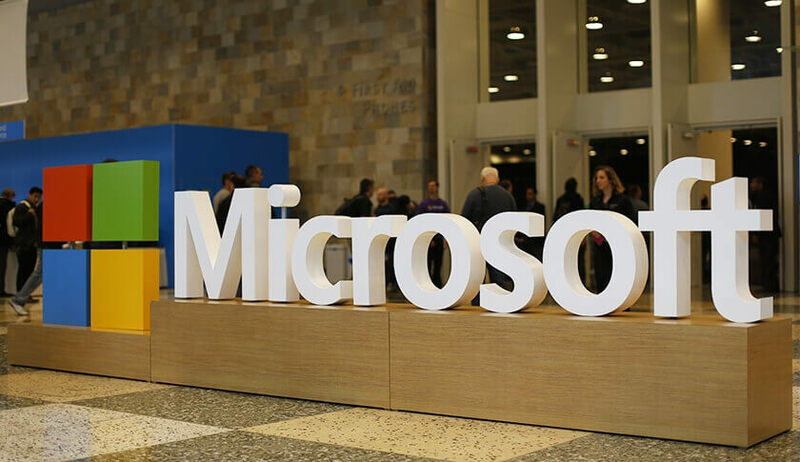 The report also showed how Microsoft’s $26 billion acquisition of LinkedIn is contributing to its productivity and business processes segment. Quite well, it turns out. LinkedIn was expected to generate $950 million in revenue during its first full quarter but managed to make even more - $975 million. Yet again, one area where revenue is heading in the wrong direction is the More Personal Computing segment, which incorporates Windows, devices, gaming and search. Its revenue of $8.8 billion is down from $9.5 billion one year ago. The 7 percent overall decline was mostly due to Microsoft’s struggling phone business and lower Surface revenue, which fell by 26 percent. As an avid WinPhone fan, I'm still deeply troubled by their lack of impulse and proliferation in this area. They didn't even send the 950 or 950xl to Verizon (the biggest carrier is the only reason this is important), so it's like they're not even trying. There's only a handful of Win10 phones on the market now with even fewer providers. Frustrating. I'm still using my Lumia 928 with WinPhone 8.1, and there hasn't been a new app of course in years. But it's such a great system and the phone is still nice. I'd have gone to a 950 if Microsoft had allowed Verizon in on the deal. Yea any cloud services im willingly investing in is staying far, far away from microsoft. Theyre not doing the surface line any favors but ignoring the lower end market. My surface 3 is a brilliant device although its built like crap. Release a convertible laptop (not a tablet with a floppy keyboard) with pen input for $500 and watch it fly off the shelves. Perhaps when the mobile Ryzen lines emerge we'll see some decent alternatives and competition to the Surface line. I can't imagine Microsoft using the chips, but other players (Lenovo?) might do some splendid things with them. 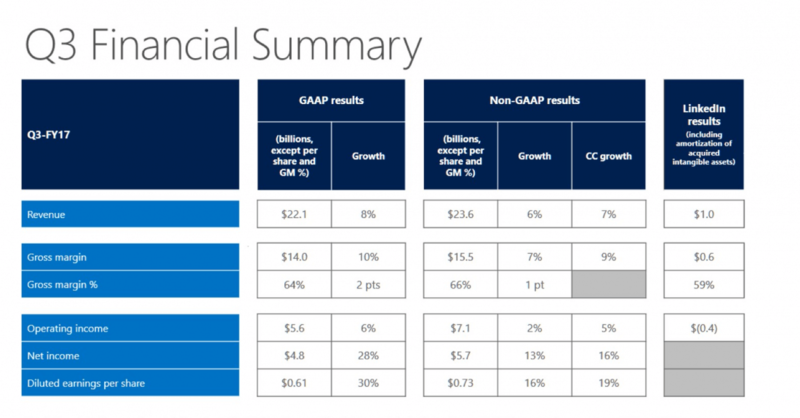 Focusing on MSFT hardware sales in an earning reports is like talking about iTunes revenue for AAPL. Largely irrelevant for the future of the company. Verizon has been the smallest supporter of Windows Phone/Mobile, why would you think it would end up there? AT&T & T-Mobile have been the only US carriers carrying any Windows mobile devices. These carriers have to want to carry the devices, not the other way around. I agree, I have a surface Pro 4 for work and I really like the device as the hardware performs well, I've had no issues with the touchscreen and has been very responsive and accurate. The pen has worked well for the few times that I've used it, but my biggest complaint is the keyboard. Its friggin terrible.